Healthy frozen meal pioneer Lean Cuisine has unveiled their newest product, Lean Cuisine Salad Additions. Designed to elevate salads made at home to restaurant quality level, these products contain chicken and vegetables packaged together in a steamer bag which, after heating, are to be poured over lettuce. Varities of this new product include Bistro Chicken Salad, Cranberry and Chicken Salad, Southwest-Style Chicken Salad, and Asian-Style Chicken Salad, which contains grilled white meat chicken with broccoli, edamame, pineapple and yellow and orange carrots with sweet and savory sesame ginger vinaigrette and topped with crispy noodles. Lean Cuisine Salad Additions will be sold in grocery stores alongside other Lean Cuisine products in retailers’ freezer cases. The chicken and vegetables are packaged together in a steamer bag, allowing for quick warming in the microwave, while the dressing and crunchy toppings are separately packaged. This allows consumers to customize their creations. Lettuce suggestions are made on the package to help consumers elevate their culinary experience. Each pack (7- to 8-oz. 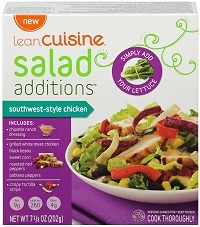 box) of Lean Cuisine Salad Additions serves one, and ranges from 240-280 calories. Based in a suburb of Cleveland, Ohio, Lean Cuisine was created in 1981 to provide a healthier alternative to typical frozen meals. They are a subsidiary of Nestle corporation. Where are the lean cuisine additions in the grocery stores? Got totally hooked on them but cannot find them anymore. Please let me now which stores carry them in the San Fernando area of Calif.